…Nothing quite like it for cooling the blood. Especially when the air temperature is below freezing. 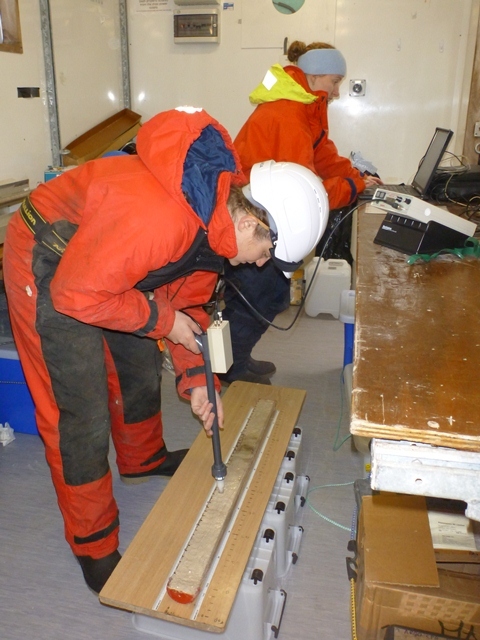 We have successfully collected a couple of cores from the Antarctic slope in between some of the CTD stations. 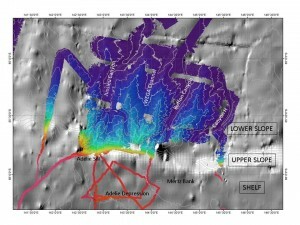 The slope is made up of canyons and ridges, some of which have been previously mapped by other voyages using the multibeam (see blog post 6: Multibeam mapping of the seafloor). We have been filling in some of the gaps in the multibeam coverage and mapping new areas, where previously there was only limited bathymetry (depth) data. We’ve been targeting the flanks of the ridges, rather than the canyons, for the cores because the bottoms of the canyons are often highly eroded by the water and sediment pouring down off the shelf. Some of this sediment settles out of the water on the flanks. 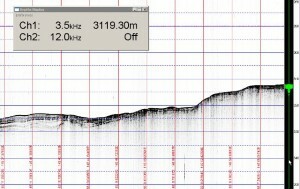 As well as using detailed multibeam maps to target the core sites, we also use a sub-bottom profiler or chirp system. This also works like an echosounder, but the frequency of the chirp system allows it to penetrate the upper sea bed and bounce back off any layers that have a change in density (which cause a change in sound velocity, a type of seismic line). We pick coring locations where we can see lots of layers in the sub-bottom profiler. 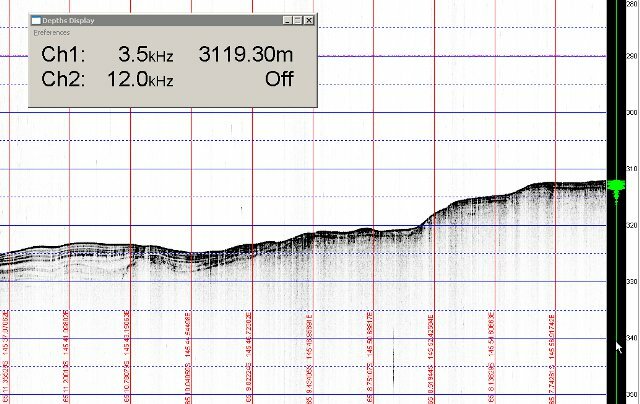 Unlike most of our sounders the chirp system is audible to humans, so the “chirping” has become a constant companion on the ship. The gravity corer has a 6.5 m barrel (pipe) on it and the longest core we have recovered on the slope has been a whopping 6.2 m – a new record! Once the gravity core is on board the boat, we remove the plastic liner with the mud inside from the metal core barrel, and measure the total length. We then cut the core up into sections of about 1 m and split each section lengthways so that we can visually describe (log) the core. We describe the colour, texture (grain size – mud, sand or gravel),and any fossils or structures (laminations, deformation, erosional features or burrows) that we can see. We also make a note if the changes in the core are abrupt or gradual transitions. Next we measure the sediment in the core for its magnetic susceptibility. This gives a relative measure of the changes in the amount of grains that are magnetic (so it picks out iron or magnetic rich layers). We use a long probe that looks like a ray gun straight out of a Star Wars movie, and we analyse the core every 2 cm down its length. This gives us an idea of changes in the amount of sediment that has come off the adjacent coast (or evidence for volcanic ash), as these layers often have more iron in them than the carbonate or silicate marine microfossils that make up the rest of the sediment. The cores are then wrapped up and stored in a fridge to stop them drying out. When we get back to the laboratory we will undertake a whole suite of analyses on the cores. The exact analyses that we undertake on the core will depend on the question that we are trying to answer, but can include: X-rays (same as you get when you break an arm of leg ) to look for structures that are not always evident to the eye ; detailed grain size; carbonate and opal (biogenic silica) content; density; visual identification of microfossils or other grains down the microscope; and a whole array of geochemical proxies such as organic biomarkers, rare earth elements and stable isotopes. We hope that the analyses on these cores from the slope of Wilkes/Adelie Land will reveal natural changes such as the extent of sea ice and amount of Antarctic bottom water formation (see blog post 21: The formation of the Antarctic bottom water) over glacial/interglacial cycles (which occur approximately every 100,000 years). Timing is everything. How old is a 6.2 m core? We won’t know until we date the sediment. Hopefully we can date the cores using biostratigraphy (fossils that are known to originate, or go extinct, at a certain time), or radiocarbon dating (if there is sufficient organic carbon or carbonate and it is younger than 50,000 years). Once we know the age of the major changes in the cores we can determine if they are simultaneous with other cores analysed from around Antarctica and the rest of the world. In this way we provide a small piece of information to the giant 4 dimensional puzzle of understanding earth’s ever-changing oceans and climate. And who wouldn’t want to play with mud? It’s every little kid’s dream.